It’s the time of year to start thinking about the garden, and again I’m finding myself with heaps of empty egg shells. Of course the shells can go directly into the compost pile, but I’m always trying to find new uses for them so nothing goes to waste. Last year, I raved about our “Homemade Monster Tomato Fertilizer” which uses dried and crushed eggshells as a fertilizer ingredient. This year, I thought why spend so much on seed starting pots, when a few seeds can easily germinate in a simple, nutrient-rich eggshell? They’re a great, inexpensive and bio-degradable way to start your seeds. Plus, eggshell planters also make the perfect project for little hands, so get your kids involved! It seems so tiny now, but a tomato plant will sprout from this shell. To create eggshell planters, you may first want to boil or steam your saved eggshell halves for a few minutes to sterilize them. Next, mix your seed starting soil with water and allow it to hydrate a few hours before scooping it into the shell. Then place one seed of your choice into each of your newly-filled eggshell planters, set them in a carton so they’ll sit upright, and cover. If you need to label your started plants so you can tell them apart, I just write directly on the eggshell with a felt tip marker. Voila: eggshell planters! Depending on the seeds you’re starting, you may need to keep the eggshell planters in a warm space to germinate. Tomato and pepper seeds, for example, require heat so I usually set mine over a heat mat to get those little buggers to pop up. Once the seeds have sprouted, move your carton into a sunny window sill or place it under a grow light. Your sprouts will likely need to be transplanted into a larger pot or planter before moving them outside to harden off. When transplanting your baby plant from an eggshell planter, whether to a larger pot or directly to the garden, first crush the shell (gently so as to disturb the roots as little as possible), then simply bury the whole eggshell, root ball and all, right into its new home. Have you ever started your plants in an eggshell before, or do you have another fun project you do with your eggshells? Please share in the comments! 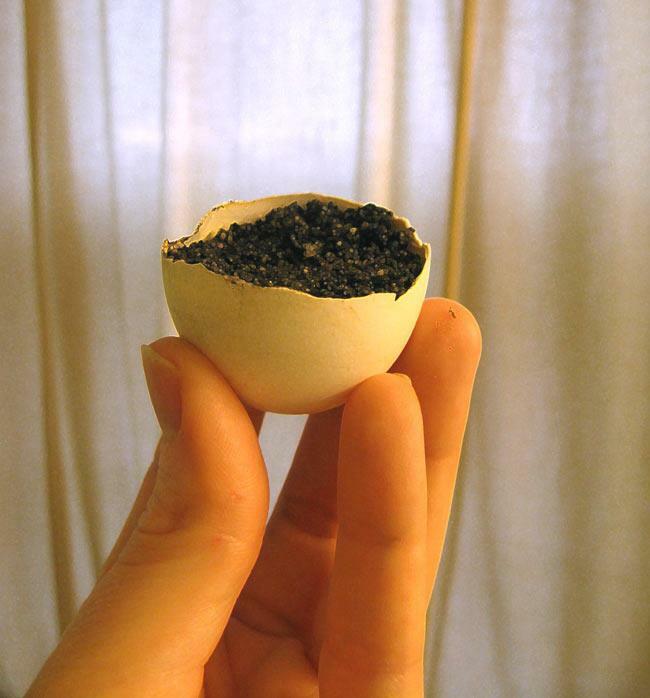 I eventually get buried in eggshells, so I would love to see what else we can do with these nifty little things. We had a friend tell us that you can actually feed the chickens the eggshells for extra calcium. We tried a few with our girls and they really like it. Is there any reason this is a bad idea? Just a word of caution – I tried this a couple of years ago and set the carton of egg shells up in a windowsill. My dog tried to eat them. What a mess! So, keep the egg shell planters away from indoor pets. And to answer Kerry, yes, you can feed the shells to your hens. But, mash them up first. You don’t want shells to look like shells which could give the hens the idea to start egg breaking and eating. We mash our eggshells for the chickens but don’t bother to crush them fine. They peck at them and make them the size they can handle. I also boil eggs and mash them to feed back to the chickens when I get more eggs that I and my friends can use. When I was a child, many moons ago, my grandmother boiled, shelled and mashed eggs to feed to baby poultry. Her specialty was turkeys, hence the name Turkey feed was given to this dish which was also a delicious dish for us kids just mixed with a little soft buttered bread. I do feed egg shells back to may girls, as well as use them in the garden. There are so many fabulous uses, but those egg shells just keep on coming faster then I know what to do with sometimes. I save my shells all winter. Use egg, dry shell on paper towel overnight, hand crush in a lidded coffee can (kept under the sink). Come spring I crush a bit better & sprinkle them around my strawberries to keep the slugs off the berries. Berries are strong, healthy, prolific & sweet! Shannon, what do you use to fertilize after the plants have been planted? I also use Fish emulsion for everything throughout the season. I can side dress with compost if I have some ready, but usually I don’t have much left after turning compost into the beds from the early spring time.